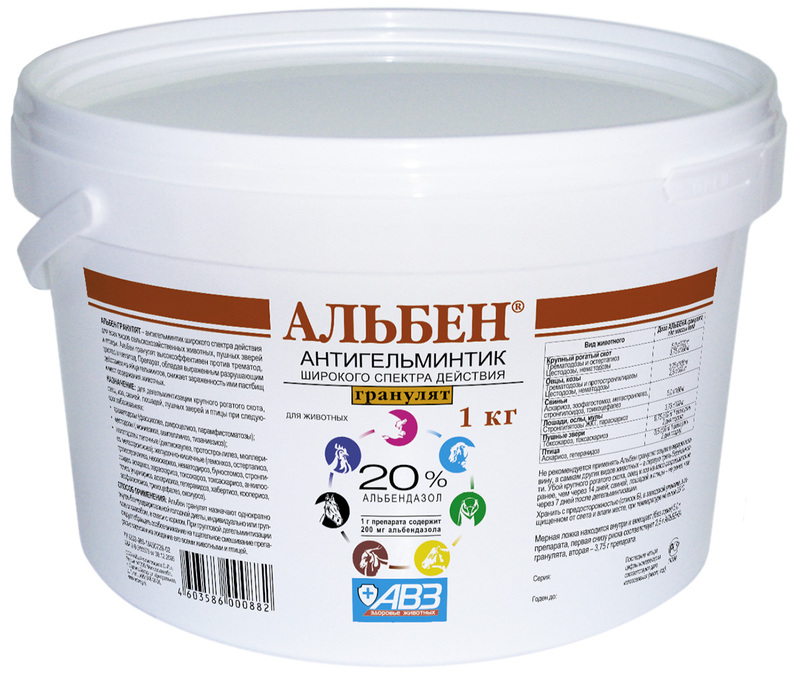 Alben granules - 1 kg polymeric bucket, 0.5 kg multilayer paper bag. Alben tablets - box (100 tablets). 1 tablet contains albendazole - 0.36 g (as an active ingredient), as well as excipients. 1 g of granules contains albendazole - 0.2 g (as an active ingredient), as well as excipients. Mechanism of albendazole action includes selective inhibition of beta-tubulin polymerization, damage of glucose transport and activity of microtubular system of worm intestinal canal cells, blocking of movement of secretory granules and other organelles in muscle cells causing paralysis and death of worms. 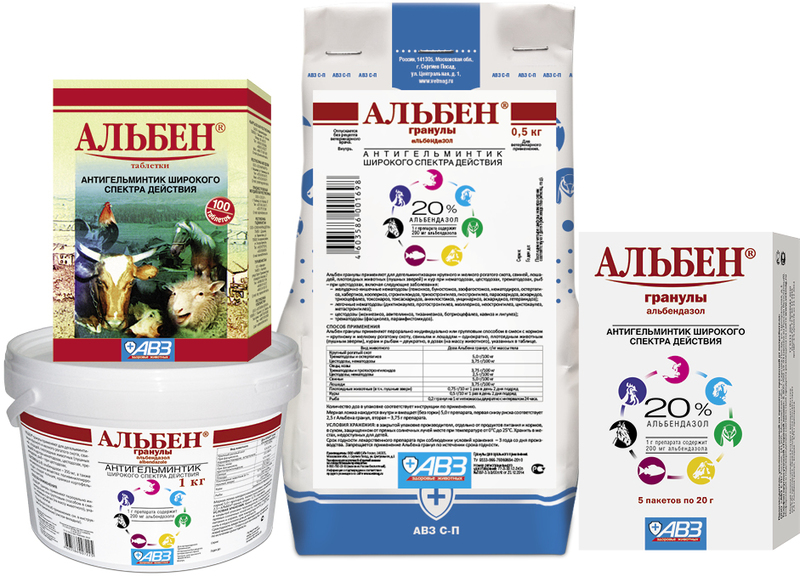 Group administration: mix body weight-based dose of Alben granules with concentrated feed. Dosage per animal is listed below: horses and cattle - 0.5-1.0 kg; sheep, goats and pigs - 150-200 g; poultry - 50 g; carnivorous animals - 50-100 g.
Fill feeders (aimed at 10-100 animals) with the obtained medicated mixture providing animals with free access. 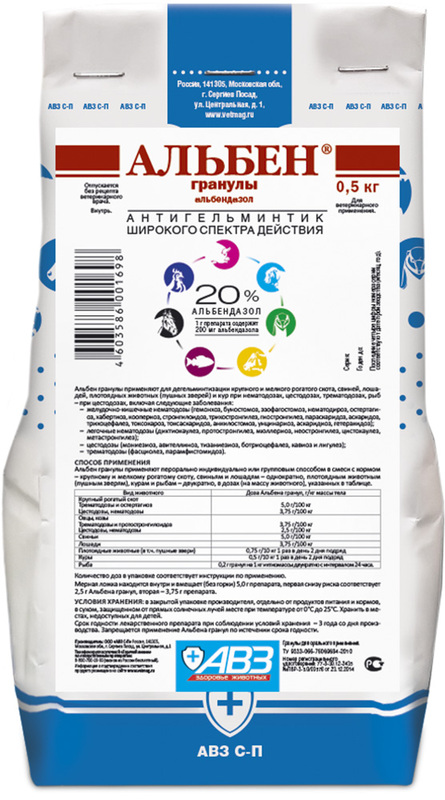 Fish: group administration of Alben granules with feed (0.2 g per 1 kg of ichtyomass). Factory use: add 4 kg of Alben granules to 1 ton of feed mixture by trituration. Farm use: suspend 1 kg of Alben granules in 7-10 l of water and mix in mixer with 250 kg of feed stuff. Use the obtained mixture without previous starvation diet for 2 times, 24 hours apart. Daily quantity of feed is 5% of fish body weight.